「Triangle」is an adverse shape for roof design in feng shui perception, it will induce mental unsoundness for people staying under the roof as well as increase in anxiety, unstable mood and bloody accidents. 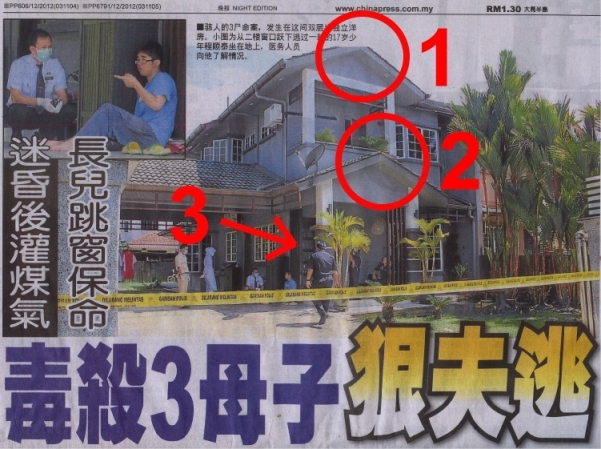 Recently the notorios husband whose killed his loved one was also staying in a house with triangular roof design (see '1' & '2'), is this a coincidence? Furthermore the main door is at the right side(white tiger position see '3') which is also not an ideal side, time after time all these bad energy accmulate until a point that tragedy happen. Previously similar house design has also resulted 2 tragedy - a family of three and maid were killed in the fire and tutor beat primary student severely. Thus we can see how triangular design has seriously induced mental unsoundess so it is advisale to handle it with care. Solution: Under the triangular shape, place a old Chinese coin, a mirror or bagua to resolve the killing(sha).